Holiday food gets center stage this time of year. All the attention goes to the turkey, stuffing, casseroles, mashed potatoes and pumpkin pies. Yes, I know they are all delicious. However, every good meal deserves a good cocktail pairing. Especially this time of year! 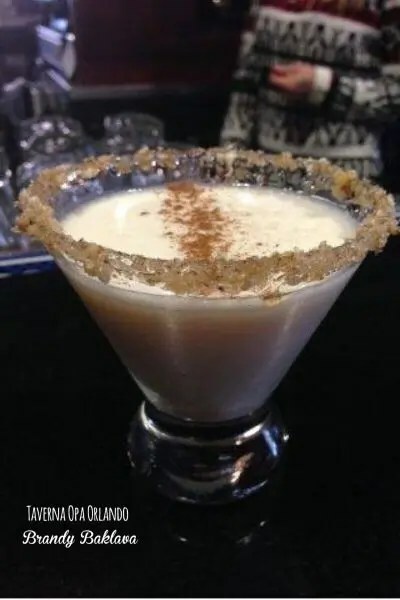 These Orlando restaurants have come up with some fun adult beverages to celebrate the season that do not disappoint. They were gracious to share the recipes with Go Epicurista for Easy Entertaining at home. If you don’t feel like doing all the work, and prefer to GO out on the town, just stop by and let their bartenders do what they do best. These Holiday Cocktails Recipes will make your holidays just a bit more cheerful. GO celebrate with friends! ** Sadly, this restaurant was closed in 2015. 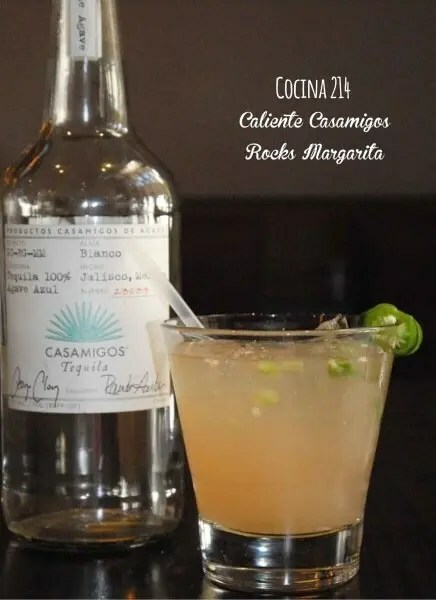 We have great memories and this fantastic cocktail recipe. B Resort & Spa’s American Q is quickly becoming known not just for their mouth-watering parade of smoked BBQ meats and their extensive buffet served from the back of a vintage pick-up truck, but also for their creative cocktails. 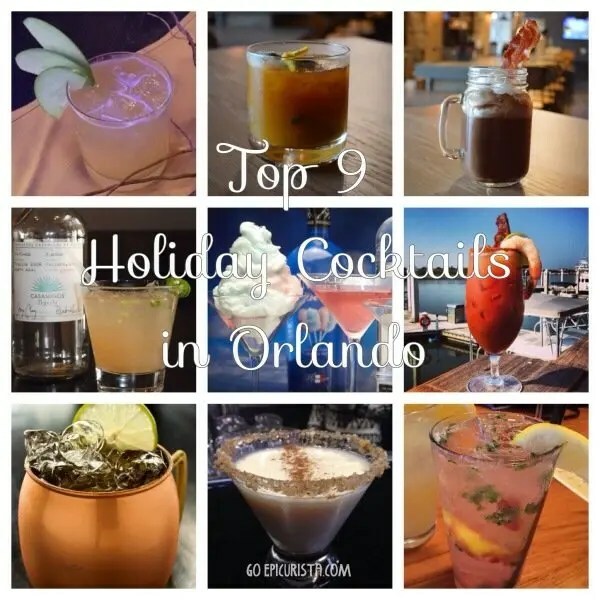 They are on the Top 9 Foodie Happy Hours in Orlando List for many reasons. Their Cherry Bacon infused Manhattan is one. Through the end of November, the Smoked Sage and Pumpkin Manhattan cocktail is reason #2. 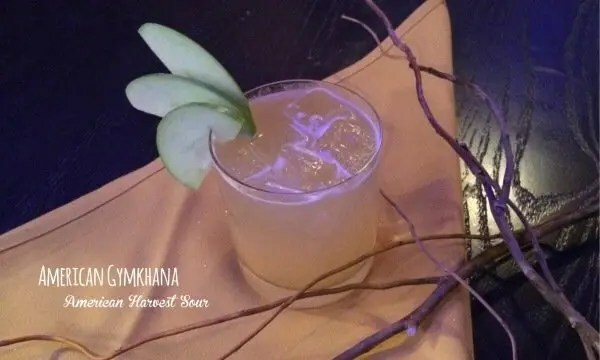 If you’re a fan of autumn flavors, this cocktail will leave you wishing fall was year-round. Located at 1905 Hotel Plaza Blvd, Lake Buena Vista, FL 32830. 407-827-3080. 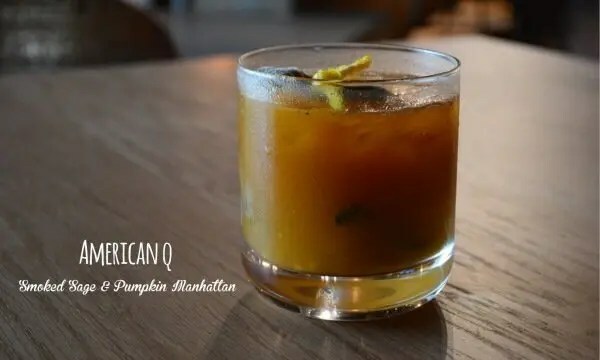 I told you American Q had a killer cocktail menu, right? Well, here is another good reason why it’s one of my favorite happy hour spots. Who can resist bacon infused anything? Add the warm smoky goodness of Bourbon and the decadence of chocolate and you get a sinful treat! 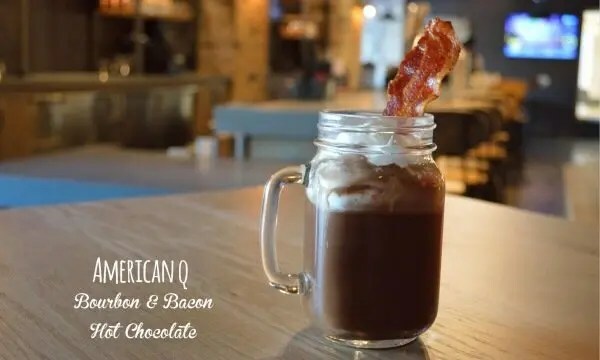 You can make this grown-up hot chocolate at home with this recipe or just GO to American Q and let them make one for you. That swine candy is worth the drive! – Heat all ingredients except for bourbon and bacon fat in a saucepan, do not boil. Whisk until incorporated. – Once mixed well, remove from heat and whisk in bacon fat until frothy. 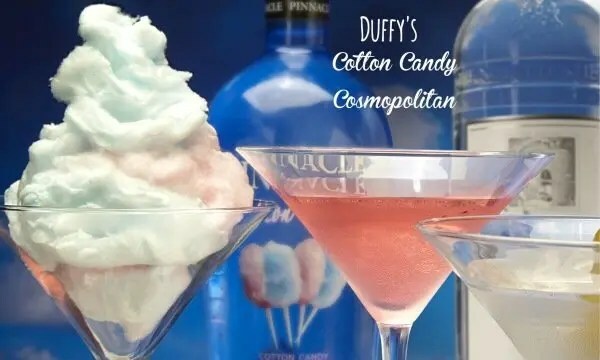 – Add bourbon and serve in mugs with a dollop of whipped cream, crumbled swine candy and a garnish of ½ piece of swine candy. – Mix all dry ingredients well. – Muddle serrano chilies and shake into a cocktail mixer. – Mix in other ingredients. 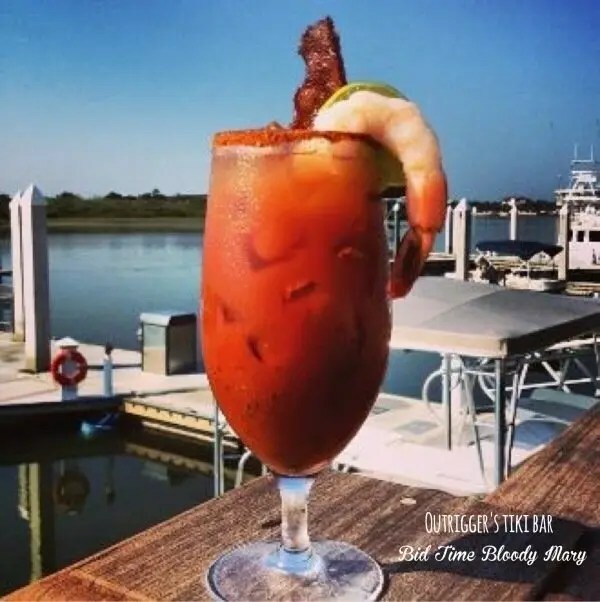 Soon to be celebrating their one year anniversary, Outriggers Tiki Bar & Grille’s Bid Time Bloody Mary is perfect for holiday brunches and morning-after holiday party recovery. It is practically a meal and I love how it uses Bloody Mary ice cubes. Guaranteed to provide a zesty wake-up call to your taste buds. We have the luxury in Florida of enjoying the best weather during holidays. This lovely spot by the water at the New Smyrna Marina will make you forget the snow storms elsewhere. I love Florida! Located at 200 Boatyard St, New Smyrna Beach, FL 32169. 386-428-6888. – Rim glass with blackening seasoning and merlot salt mixture. – Add Bloody Mary mix ice cubes and pour Tito’s Vodka over ice cubes. – Garnish with candied bacon and cocktail shrimp. RA Sushi at Pointe Orlando offers a great selection of sushi creations in a modern hip Las Vegas style atmosphere. 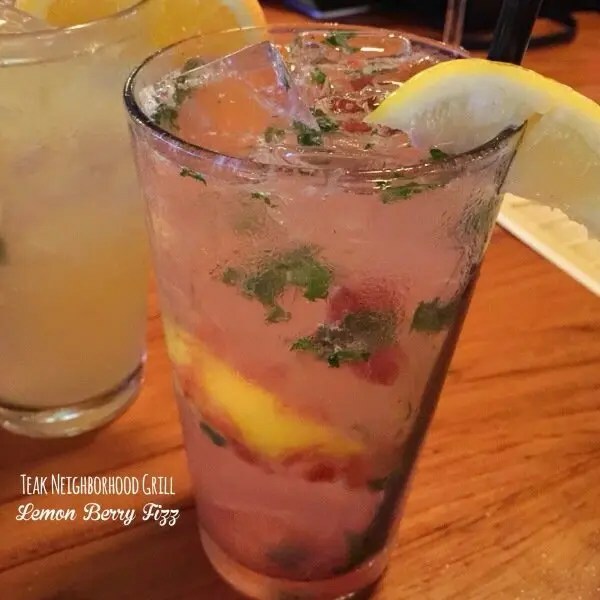 It’s a great spot for happy hour with friends and was featured in the Go Epicurista Top 9 Foodie Happy Hours in Orlando List. This Black Friday, escape the hustle and bustle of the crowds and enjoy a special happy hour from 11am-7pm with over 25 sushi and appetizer options, beers, wine and cocktails specials. That is what I call retail therapy. Happy hour day indeed! 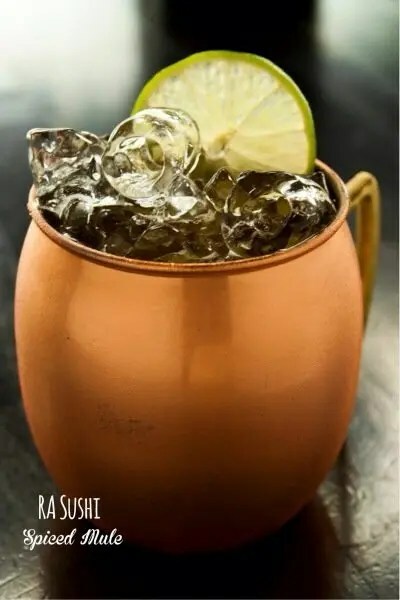 Through January 31st, in honor of the holiday season, they have given the traditional Moscow Mule a holiday twist. As a bonus, purchase the signature copper mug so you can make this refreshing concoction at home year-round. Located at 9101 International Drive, suite 1008, Orlando FL 32819. 407-454-5600. – Dip the honey-rimmed glass into the nuts to coat the edge of the glass. Set aside. – Fill a shaker with ice, add the first 6 ingredients and shake vigorously to chill and combine thoroughly. Strain the drink into cocktail glass and sprinkle a pinch of cinnamon on top. Teak is the home of the best burgers in Orlando, with 27 crazy creations on their menu plus a secret menu with 10+ and more added on a monthly basis. It is truly what you consider a neighborhood bar. Great food, a rotation of craft beers and fun cocktails. I recently tried their Lemon Berry Fizz and the colors reminded me of the holidays. It is available after the holidays so if you ever need a reminder of this fun time of year, sit back, sip and enjoy! Located at 6400 Time Square Ave, Suite A, Orlando, FL. 407-313-5111. Which cocktail will you be making this holiday season? Whether at home or out on the town, take the time and GO celebrate the holidays with friends! Wowie – the Brandy Baklava looks amazing! Will be there in a few weeks and will be sure to have one! Please have one for me too! I love dessert in a glass. Opa! I love outriggers and I love bloody Mary’s. I have gotten some of their other mixed drinks, but not this one. I must try it! That Bloody Mary looks insane! Great for brunch. Cheers! Thanks for stopping by Lara!